InvivoGen provides soluble forms of the pattern recognition receptors, Dectin-1 and TLR5, that consist of the extracellular domain (ECD) of each receptor fused to an IgG1 Fc domain, engineered to reduce ADCC and enhance half-life. 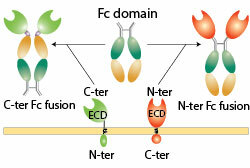 Dectin-1, which is a type-II transmembrane receptor, is fused to the C-terminus of the Fc domain while TLR5, which is a type-1 transmembrane receptor is fused to the N-terminus of the Fc domain. The soluble Dectin-1 and TLR5 receptors can be used for receptor binding assays or neutralization studies.